Joshua Kasumovic is the beverage director at George’s at the Cove and general manager of George’s Bar. In his role, Joshua oversees operation of the beverage programs for both George’s Ocean Terrace (casual dining) and George’s California Modern (fine dining), as well as all bar area operations. A certified sommelier through the Court of Master Sommeliers, Joshua works with a list of more than 400 wines to develop pairings for the restaurant’s 4– and 8–course California Modern tasting menus, as well as the 13-course TBL3 experience. Known for his creative spirit, Joshua’s mission is to ensure George’s remains cutting edge and continues to evolve with a rapidly changing marketplace. 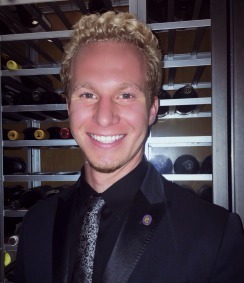 Prior to joining George’s in May 2015, Joshua spent nine years working in a variety of hospitality positions from catering and wine sales to restaurant managerial positions, most recently at Searsucker in San Diego’s vibrant Gaslamp Quarter. This well-rounded background provided invaluable training from a young age and a clear vision for how to achieve his goals. A perpetual student, he attends blind tasting groups regularly and studies on his off time, working toward attaining his Cicerone Certification, CSS and Advanced Sommelier Certification. Joshua is currently working closely with George’s at the Cove partners to develop and launch a new concept and identity for the bar level that will coincide with an extensive remodel set to debut in early 2016.